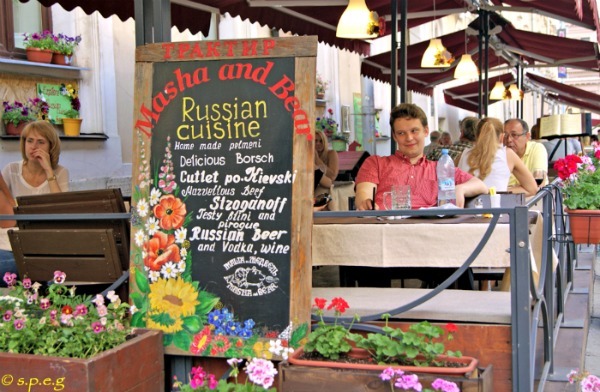 Masha and Bear Restaurant: One of the best Russian restaurant in the Imperial city. St Petersburg's Masha and Bear (Masha i Medved in Russian), is named after the famous Russian folktale and children's story that is a popular animated cartoon loved by children worldwide. Inside, the décor is modeled after the motif of folklore in a style that is uniquely Russian, which makes it a quaint and entertaining place to dine. While favored by tourists for its fashionably fun theme, the cozy atmosphere has a distinctly local feel and is why this place is known for providing a truly authentic Russian experience. In warm weather, the beautiful floral terrace invites customers to dine at street level while enjoying the sun and passers by along this side street off the famous Nevsky Prospect. 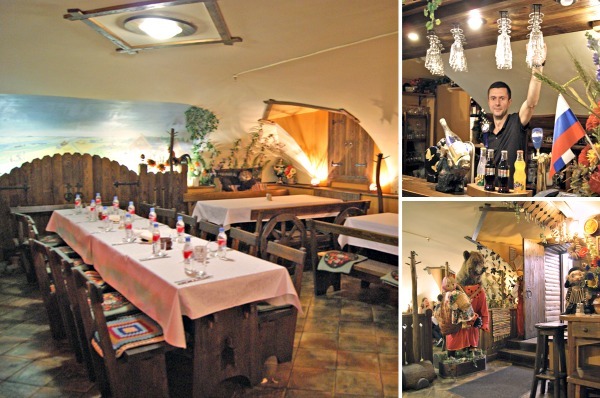 But, the main restaurant is located in the basement, which hosts a cozy and welcoming setting. Tables by a fireplace, crisp linen tablecloths, napkins and fine tableware give the casual ambiance that special twist of renown Russian excellence in dining! We have eaten at Masha and Bear and had a great experience! The food was tasty and the service was fast and friendly. Due to its central location, the restaurant becomes a popular tourist hot spot in the summer months, when both locals and visitors enjoy dining outdoors, while during the rest of the year is more quiet. 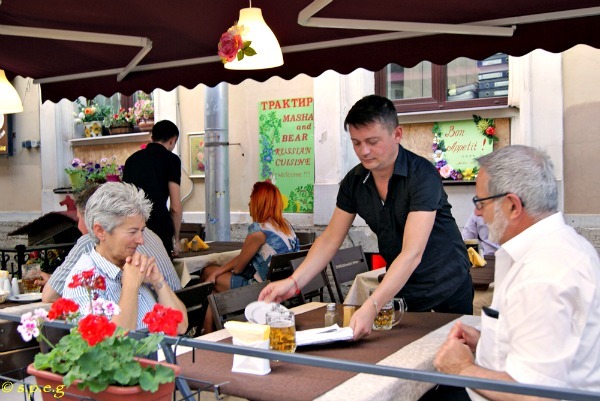 Tourists eating at the terrace of the restaurant located on the side street off the famous Nevsky Prospect - Photo by Anastasia K.
The restaurant's menu offers a wide choice of delicious, traditional Russian food, such as Beef Stroganoff, Borsch and Chicken Kiev. A plate of smoked fish, herring and onions and pancakes are prepared and presented to perfection, but the baked salmon topped with caviar cream is one of the tastiest dishes on the menu. This delightful St. Petersburg establishment offers savory soups, fresh salads, hearty grain baskets, rich sauces, scrumptious hand-cut fries and excellent beer. Photo of tourists eating outside at the restaurant during the summer - Photo by Anastasia K.
It's impossible to honor a low-fat diet when dining here, but you won't want to! If you're in the mood for dessert, the pancakes with condensed milk taste just like grandma used to make growing up in the village. That's the highest of compliments! Dishes are served by a friendly, attentive waitstaff who speak English and an English menu is available. Visa and Mastercard accepted and reservations are recommended due to Masha and Bear ever-increasing popularity! If you love dining outside on a warm summer day and enjoy watching the world go by right in the heart of the great city of St Petersburg, then this is the place to go. WHERE YOU FIND IT: The restaurant is located on a pedestrian street very close to the famous Nevsky Prospect in the heart of the city. PRICE RANGE: $$$ - From $25/27€ to $40/37€ per person for a full meal, including a drink. OUTSTANDING POINTS: Just a few minutes walk from Kupetz Eliseevs Food Hall, Alexandrinsky Theatre, Catherine Park, the Russian Museum, Mikhaylovsky Theatre and the old department store Gostiny Dvor. GOOD FOR: Groups of people, friends, and families as well as solo travelers who want to have a Russian dinner or lunch in the city center. Make your reservation easier, faster and stress free! Book a table to Masha and Bear with St Petersburg Essential Guide and get the best place in the restaurant before you come. It is free, simple and convenient! Book a Table Online Before You Go! Have you been to Masha and Bear before? If you have, please tell us how was your eating experience. Leave a comment below as a guest or sigh in with your favorite social account. It only takes one minute! Thanks. Return from Masha and Bear Restaurant to St Petersburg Restaurants or go to the Home Page.